With primary season just around the corner, voters will soon start hearing a familiar refrain: "I'm Candidate X, and I approve this message." Since 2002, federal law has required the tagline on all ads paid for by candidates for federal office. The aim was to discourage negative campaigning. But newly published Berkeley Haas research shows that it's actually made attack ads more powerful. "People tend to be suspicious of political rhetoric–especially negative political rhetoric," says Assoc. Prof. Clayton Critcher of the Haas Marketing Group. "But we found that the mandatory tagline has an unintended effect: It makes ads attacking an opponent's policy positions seem more credible." In a series of experiments, Critcher and co-author Minah Jung of New York University's Stern School of Business found that adding the tagline to policy-based attack ads not only makes them more believable, but gives people a more positive view of the candidate who gives the tagline endorsement. Their paper, "How Encouraging Niceness Can Incentivize Nastiness: An Unintended Consequence of Advertising Reform," was published this month in the Journal of Marketing Research. "Although we think political consultants are not currently aware of this ironic effect, we clearly know regulators did not mean to help to legitimize negative and often misleading ads," Critcher said. As a psychologist who studies judgment and decision making, Critcher had long been curious about whether the ubiquitous taglines had any effect on voters. 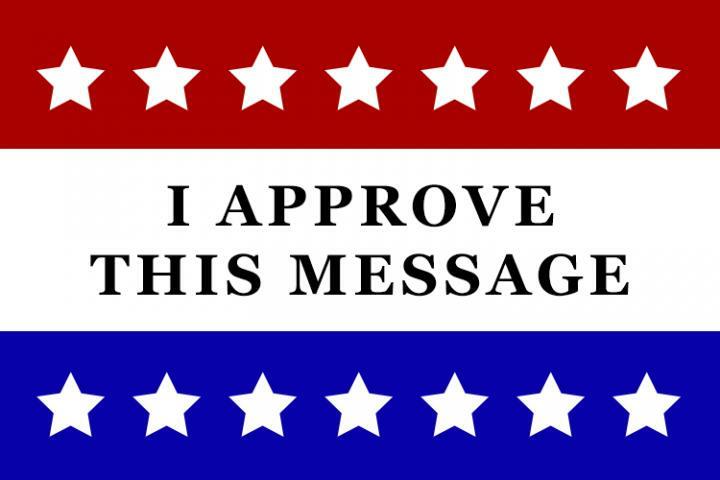 The "I approve this message" tagline originated with the "Stand by Your Ad" (SBYA) provision of the Bipartisan Campaign Reform Act of 2002, better known as McCain-Feingold. "John McCain had this great speech from the Senate floor in which he said that candidates wouldn't approve the trash their campaigns were putting out if they had to put their face on screen and stand behind it," Critcher said. "We now know that despite the law, there has been no slowdown, and in fact an escalation, in negative political advertising." The percentage of negative ads swelled from 29 percent in 2000 to 64 percent in 2012, according to research cited in the paper. A CNN analysis found that in the week before the 2016 presidential election, a full 92 percent of ads were negative. While the rise of SuperPACs explains a lot of the growth in negativity, the candidates own messaging has grown more negative as well. How Do Voters Respond to "I Approve"? But rather than look at whether the mandatory tagline has encouraged politicians to change their messages, Critcher and Jung wanted to know whether it changes how voters respond to those messages–and if so, why. Past research has found that negative ads can be more effective than positive ones, but campaigners who go negative face the added hurdle of overcoming voter skepticism. This hurdle is higher with character-based hit pieces, which voters may not see as relevant. Does someone's affair or tax evasion penalty mean they will be a poor leader? In contrast, attacks on an opponent's policy positions are clearly relevant to the job, but what undermines them are suspicions of their truthfulness. The researchers suspected the tagline might influence that. The researchers experimented with real and fictional ads in video, audio, and print formats, conducting four experiments on about 2,000 people recruited from universities and Amazon's Mechanical Turk. They used ads from Congressional races from 2006 to 2010, as well as fictional ads they created by editing together snippets from real advertisements. They began by asking about 400 people to watch eight TV ads aired by Democratic and Republican candidates in recent Congressional races. In this set were positive and negative ads from each party focused on candidates' character and policy record. Crucially, the researchers edited out the tagline on half of the ads each viewer saw. What they found is that although the tagline did not consistently change people's reaction to positive ads or ad hominem attacks, the tagline did give a clear boost to the policy-based attack ads. In addition, people had a more favorable view of candidates running negative ads when the tagline was included. The researchers found the same pattern in a second experiment using ads they wrote themselves, which allowed them to more precisely control for the ads' content. The effect was substantial: Across all their experiments, the researchers found that the tagline had an even stronger effect than did partisanship. "It may seem intuitive that Democrats and Republicans believe that Democrats and Republicans, respectively, run truer ads. It is remarkable that mandatory endorsements can have effects that are at least as large," they wrote in their paper. Critcher cautioned, however, that the effect may sound exaggerated, because participants were not generally familiar with the candidates in the ads, and most ads, designed for broad appeal, don't state candidates' party affiliation. Still, given the closeness by which many races are decided, campaigns invest heavily in turnout operations that have much smaller effects, he noted. The researchers were also surprised when they began parsing out why the tagline works. Do voters not realize the tagline is simply required of all ads? Does it confuse them into thinking regulators have vetted the ads' content? They ran two more experiments with large sample sizes (639 people and 565 people) and found that even when participants were told the tagline was required by law, and that no regulators had vetted the content's veracity, they still said the ads that included a tagline were more believable. Participants also were largely unaware of the tagline's effect: Even those who said that it didn't influence their evaluation of the ad were indeed influenced by it. The researchers were able to invent brand new taglines (which they had voice actors deliver), attach them to ads, and tell participants that the law required candidates to deliver the tagline. They observed the same boost to ad credibility. "We initially thought the boost came from what sounded like an implicit promise of the ads' truthfulness–with the candidate putting themselves and their credibility on the line by affirming that they 'approved' the message," Critcher said. "That was a factor, but the bigger effect was the fact that the ad had been touched by regulation. That gave a legitimating halo to the message as a whole." Critcher and Jung close their paper by considering whether the tagline should be ditched altogether. Although they didn't find a perfect solution, they did find that a more neutral tagline–one that can't be confused for an implicit promise of message truth value (e.g., "My name is X, and I am running for Y") significantly decreased the unintended consequences. "We hope that by bringing this to light, policymakers might realize this provision is not serving the public good and find a better way," he said.